Nottinghamshire produced a ruthless performance with the ball to defeat Sussex inside two days in their Specsavers County Championship match at Trent Bridge. 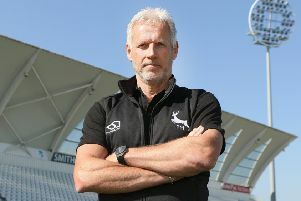 It left head coach Peter Moores delighted as Notts continue their fantastic start to the season. “I’m absolutely delighted. First as it was out first home game of the season, so we were all excited to play here but it was the style of how we played that was pleasing,” he said. The visitors were bowled out for scores of 155 and 204 on the second day, to lose their second match of the season by an innings and 88 runs. James Pattinson claimed first innings figures of four for 22 and followed it with three for 33 in the second innings, with Stuart Broad and Luke Fletcher also grabbing three wickets when Sussex batted again. After losing three wickets on the first evening, Sussex’s first innings failed to gather any momentum as the home side rotated their four quick bowlers with great success. Pattinson made short work of doubling his wicket tally from two to four in the opening 20 minutes of the day. Delray Rawlins nicked the Australian’s fourth ball of the morning behind, giving Chris Read his 500th first class dismissal at Trent Bridge. Laurie Evans was given a torrid working over and only made nine before nicking an attempted drive into the safe hands of Samit Patel at second slip. There was no let-up for the visiting batsmen with Jake Ball belatedly entered the attack and gained immediate reward as Stiaan van Zyl nicked behind for 28. Broad put down a difficult one-handed diving attempt to dismiss Luke Wright, when the Sussex captain was only on three. Ball made the decisive breakthrough, bowling Wright for 34 to leave the visitors on 93 for seven. Ben Brown was pinned in front of the stumps to become Luke Fletcher’s sole victim but Notts were then held up by Jofra Archer. The 19-year old top-scored with a 29-ball 40, which included two sixes but he couldn’t resist hooking Broad straight into the hands of Greg Smith at deep backward square. Samit Patel’s slow left arm spin accounted for Steve Magoffin, leaving the visitors to spend lunch facing the prospect of having to bat again. Things began disastrously, second time around, as Broad removed Harry Finch and Delray Rawlins, both for nought. Nash and van Zyl added 62 for the third wicket but the switch to the Pavilion End worked wonders for Pattinson, who removed them both. The Australian had van Zyl caught behind for 21 and then pinned Nash lbw for a battling 53. Laurie Evans went the same way, also without scoring, leaving Fletcher to take the plaudits by skittling the next three batsmen. Brown edged to second slip, Wright chipped to mid on for 34 and Stuart Whittingham nibbled behind. Archer connected with some lusty blows in making 47, before becoming the 17th – and final – Sussex wicket to fall on the day. Nottinghamshire take a maximum 24 points from the contest, after starting life in the second tier with three consecutive victories. Sussex’s second loss delivered only three bonus points.